Frustration? Pain? Boredom? Or... humor? With this nasty strangles going around the herd, Far had developed a large hard lump under his jaw for quite a while. It was so sore in the last few days he couldn't put his head all the way down to eat out of his feed bucket on the ground, so we had to tie it up on the fence for him. When the lump finally busted the other day, we put him in a pen, just so he wouldn't drip gunk out all over the bigger paddock. 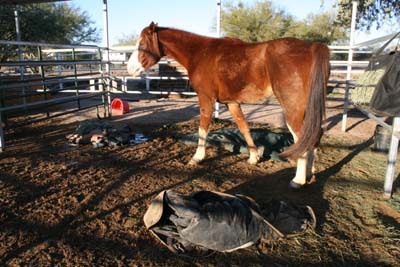 The busted lump is nasty, still dripping, and very sore, but as compensation Far did have a nice little pen of his own, with his own water and constant supply of hay, and grain twice a day in an elevated bucket, one that wouldn't bump his tender jaw when he ate. And a roof - which came in handy when it rained all day yesterday again (!) here in the desert. 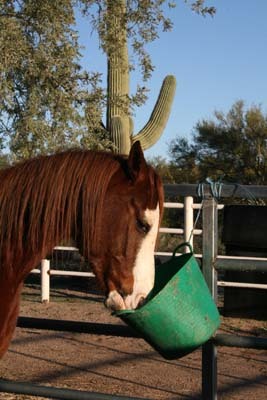 The other horses hung out by him during the days and nights, so he wasn't lacking for company. His jaw did hurt though, and he gratefully accepted sympathy, as long as a human wanted to stand there giving it. This morning, upon bringing him his feed, I discovered Far had been quite busy overnight. Five blankets had been hanging on the back boundary of his fence, out of the rain, out of the reach of Jackson, who likes to remodel and redecorate things. 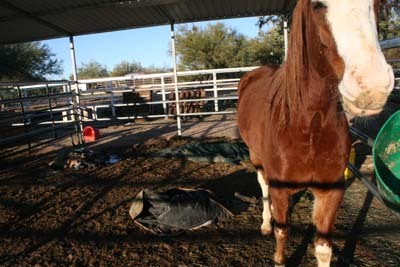 Five blankets that had been dry and hanging were now wet and sandy and spread around Far's pen, two of them dragged out from under the roof and dropped in last night's rain. 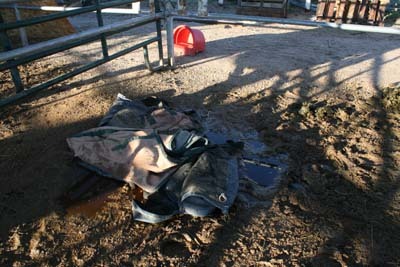 The other three blankets suffered a far worse fate, having been dropped very carefully, calculatingly, into the middle of his pee spot in the pen, swirled around, and stomped on. As I gasped my initial great dismay, Far innocently ate his grain. Far accepted commiserating pats for his hurting head, and congratulations on his artistic redecorating achievement. If you're stuck with strangles, you might as well make the mostest of it. Jackson was certainly jealous. 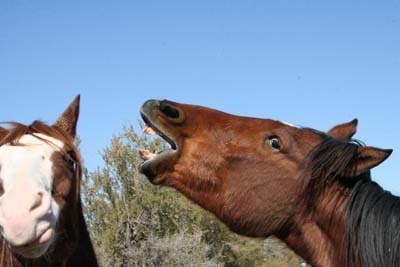 Later Far and Jose discussed the Blanket Toss Game, and Jose had a great horse laugh. Guess who apparently has a sense of humor? Obviously Far, who had the great visionary blanket rearrangement idea in the first place, and who studiously watched me groan and screech like a girl as I picked up the nasty wet sandy blankets from the muck and put them on the little hay cart with the flat tires and no handle but a string that hurts and cuts off the circulation in your hands when you pull it, and as I pulled the cart across the big paddock, through the heavy soft sand in the wash, where one of the blankets fell off, and as I struggled up the little hill on the other side to the gate. And obviously me, who will be getting sand and other... stuff all over me as I throw the blankets on a fence, pressure hose each of them - the inside and outside (think how heavy they will be to flip over!) in the warm Arizona sunshine in my shorts and tank top, with the rest of the horses watching me over the fence. Icckkyyy....don't forget that a 10 to 1 solution of water to bleach will help to keep the ground decontaminated. Wash everything down with bleach and spray the pens...helps to prevent reinfestation next year.